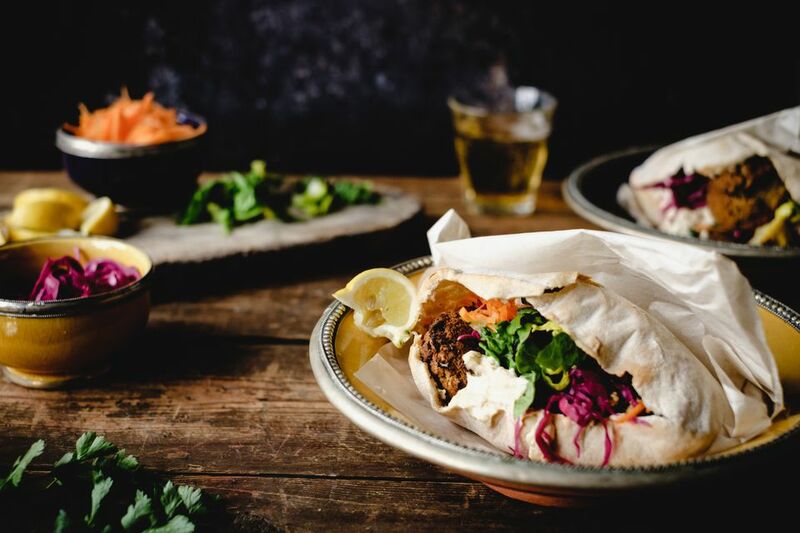 This fresh, farmer's market-driven take on the classic falafel sandwich comes from Chef Todd Gray and his wife Ellen Kassoff Gray, of Washington D.C.'s famed Equinox restaurant. While living in Israel after college, Ellen fell hard for falafel. This recipe is a tribute to the iconic sandwich. Don't feel daunted by the long ingredient list—prepping the pickled vegetables is quick and easy, and they're meant to be made ahead. Recipe reprinted with permission from The New Jewish Table by Todd Gray and Ellen Kassoff Gray (St. Martin's Press, © 2013). Combine the water, vinegar, sugar, peppercorns, coriander, fennel, bay leaves, thyme, and garlic in a medium saucepan. Bring to boiling over high heat; immediately remove from the heat and set aside to cool at room temperature. Combine the cabbage, carrots, and onions in a large, heatproof bowl, add the jalapeño if using, and toss the vegetables to mix well. Pour the pickling liquid through a mesh strainer into another saucepan; discard the spices. Bring the liquid back to boiling and then pour it over the cabbage mixture; stir gently to mix. Cover the bowl and refrigerate until the vegetables are pickled—for at least 24 hours and up to 3 days. Place 1 cup plain or vanilla low-fat yogurt in a small bowl (Ellen favors vanilla). Add to it 3 finely chopped fresh mint leaves, 1/2 teaspoon freshly grated lemon zest, 1/2 teaspoon freshly squeezed lemon juice, 1/4 teaspoon honey (if you’re using plain yogurt), and a sprinkling each of salt and black pepper. Whisk together until combined; cover and refrigerate until ready to serve. Preheat the oven to 300 F. Mix the falafel according to the package directions. Roll the falafel mixture into walnut-size balls, flattening each slightly in the palm of your hand. Pour 3 inches of oil into a heavy saucepan. Heat the oil to 325 F over medium heat (measure on a candy thermometer). Working in batches as appropriate for the pan you are using, fry the falafel in the hot oil, turning once, until golden brown and cooked through—3 to 4 minutes per side. While the falafel cook, arrange the pitas on a baking sheet and put in the oven to warm. Using a slotted spoon, transfer the falafel to a paper towel-lined plate and sprinkle with a little salt and pepper. To serve, spoon some Minted Lemon Yogurt into the bottom of each pita half, then spoon in some of the vegetables, dividing equally, and add 3 falafel. Dot some onion marmalade over the top if you wish. Swap the Minted Lemon Yogurt for hummus and a drizzle of tahini. You can puree the hummus and tahini together with fresh garlic and a little water and salt.